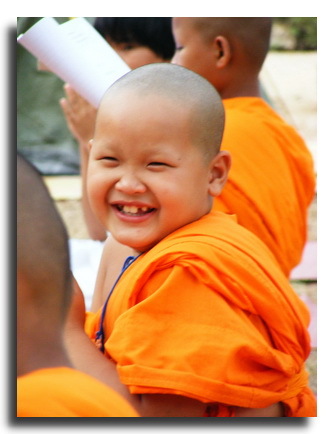 Regarding their language Thai people belong to Thai groups originating in the south of China. Migrations from south China to southeast Asia took place during the sixth and seventh century. Malay, Mon and Khmer civilizations existed in this region before ethnic Thai arrived there. Thai language also reached Laos and southern China. The Lao language is very similar to the Thai language, both written and spoken. In 1238 two Thai chieftains rebelled against Khmer suzerainty and created for the very first time an independent Thai kingdom in Sukhothai. Sukhothai saw the Thais expansion along the Chao Phraya river basin, the introduction of Theravada Buddhism as the official religion, the creation of the Thai alphabet and the first art forms including painting, architecture and literature. During the 13th century Sukhothai became a vassal state of Ayutthaya, a dynamic and young kingdom further south in the Chao Phraya river valley. 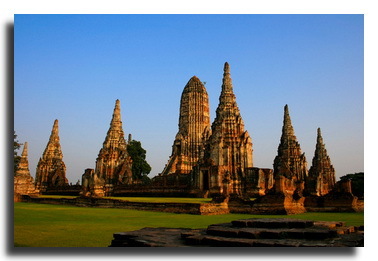 Ayutthaya was founded in 1350 and remained until 1767 the capital city of Thailand. In 1767 it was destroyed by Burmese invaders. Until 1938 Thailand was called "Siam". During the reigns of Rama 4th (King Mongkut, 1851-1868) and his son Rama 5th (King Chulalongkorn, 1868-1910) Thailand had very close relationships to western powers. The diplomatic skills and modernizing reforms of these monarchs made Siam the only one country in the south and southeast Asia that was not colonised by European countries. Because Thailand has never been colonised, its culture could develop in entirely unique way. Thai dance, theatre, music and art play nowadays the same important role as it was in the past. In 1932 a coup changed Thailand from an absolute to a constitutional monarchy. Although Thailand is nominally a democracy with a constitutional monarchy, it was also ruled by military governments. There were also some periods where democratic governments ruled the country. After the revolution in 1932, Thai politics was dominated for a very long time by the military and bureaucratic elite. Between 1992 and 2006 Thailand saw itself as a functioning democracy with constitutional changes of government. Free, fair and multi-party elections in 2007 restored democratic governance one year after the coup of 2006. The elections in 2011 preceded a stable change of power between parties in the government. The king has only a little direct power under Thailand's constitution. He is more a symbol for national identity and unity. King Bhumibol (Rama IX), who is still on the throne since 1946, commands popular respect and moral authority. Sometimes he was able to resolve political crises that have threatened national stability of Thailand.